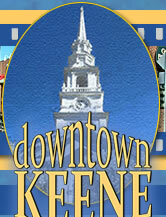 Downtown Keene, NH - Dining, Shopping, Services, Events & More! Southwest New Hampshire's Monadnock Region offers a variety of experiences for those visiting, and for those of us who are lucky enough to live here. Picture quaint New England villages, with white-washed steeples, decorating the countryside. Enjoy scenic lakes, streams and rivers, visible as you navigate our quiet country roads. While you're here, be sure to take a tour of covered bridges, a hike up Mt. 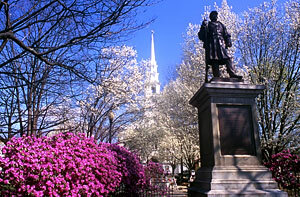 Monadnock, tour some of our many museums, or visit some of our State Parks. But there's one other "must visit" place to put on your list: Downtown Keene. Don't Forget To Shop Downtown Keene! As you spend time enjoying the scenery and charm, be sure to make a visit to Keene's beautiful downtown area. Downtown Keene is an eclectic mix of old-time shops, modern retailers, restaurants and more. All framed within a beautiful Main Street, with the picturesque (and much photographed) United Church of Christ at the top of Keene's Central Square. This web site is designed to provide you with a unique insight into the many merchants & business people that make Downtown Keene so unique. We invite you to spend some time enjoying the site. Please come back often to check the calendar, new Spotlights on merchants, more photos in our gallery, and menus for our restaurants. Thanks for visiting Southwest New Hampshire and downtown Keene! 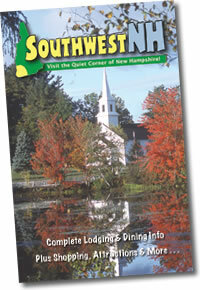 Have You Seen The SouthwestNH Visitor's Guide? We also offer a printed version of much of the information available here on this site, along with our other sites: SouthwestNH.com, MonadnockEvents.com, MonadnockDining.com, MonadnockAntiques.com, and MonadnockWeddings.com. You'll find it FREE at a wide variety of Restaurants, Lodging Establishments, Attractions, Chambers of Commerce and Visitor Centers here in the Monadnock Region. Be sure to look for it when you arrive!